General Discussion Other general discussions on topics not listed above. I'm moving the ferrocell discussion here, away from Ken's thread because it's kinda off topic. Thanks for starting this thread. I'd like to start where you left off in Ufopolitic's thread (about Ken's work). I'd like to move this conversation to the General area and leave Kens discussion. I started a new thread there but is not appearing yet. For now, open your imagination into a situation where two phases cancel out. That leaves nothing. Now you turn on a light. Then you see the "nothing". Its the lowest potential. Zero point. The Bloch region. Please elaborate. What is it? What do you mean using "Bloch"? All credible references which I can find on Bloch wall, Bloch region, Bloch line, or Bloch point puts the feature on the size scale of domains (micrometer scale) or smaller to the atomic or even subatomic scale. Then, I have my imagination open and see "nothing". Is that it? How does it apply to the image from the ferrocell? Last edited by bistander; 05-14-2018 at 04:06 PM. The Bloch region is where North turns into South another way of looking at it: where the 'field' reverses polarity. From Wikipedia: "A Bloch wall is a narrow transition region at the boundary between magnetic domains, over which the magnetization changes from its value in one domain to that in the next, named after the physicist Felix Bloch. The magnetization rotates out of the plane of the domain wall, in contrast to Néel walls". You can read further about the Neel wall, domains etc. But we're dealing with fields around particles much smaller than a domain and its a relatively new direction for research. Now lets talk about potential. Potential is like the lake holding water for the town to use. Until its used, it is only potential. Same thing with a static (stationary) magnetic field. It has a measurable potential. Now if you move the magnet relative to a ferrous metal or a coil of wire, the potential becomes induced and 'electrons' flow thru the conductive circuit. What if we were to take the contents of our lake and 'subtract the water' by inverting the potential of the lake and adding it to the non-inverted potential? We have zero. And that what we are measuring (visually and with test equipment) with a Ferrocell. We are adding two out of phase fields (N-S), and where they cancel out equals zero. This is the point of minimum potential. When you bring light into the 'zero' area, the light will 'scatter' in the zero area and will appear as a band from the source to the magnet and back to the source. It actually makes a Zero. This explanation is what convinced the patent examiners (yes two of them) at the Patent Office to grant my patent. Let me add here the width of the 'band' will be directly proportional to the width of the source light. So we're filling in the 'zero' with light. This is two small cylinder magnets next to a tiny incandescent lamp (direct rays blocked by black paper) setting below a 50mm cell. ANYONE KNOW HOW TO MAKE MY PIX SMALLER? Last edited by dyetalon; 05-15-2018 at 12:23 AM. Do not know if in your pic server you could resize images on the direct links. Last edited by Ufopolitics; 05-15-2018 at 02:12 AM. I was wondering if there was some formatting I could apply when I link the image to set the size. Guess I'll have to make sure they're 800x600 on my server. MSc. VLSI Systems Engineering, UMIST, U.K.
Ferrofluid ferrimagnetic and superparamgnetic thin film inside the ferrocell aligns parallel to the external magnetic field therefore the magnetic image produced is a perfect copy of the flux of the field under observation. Iron filings are attracted by the strongest nearest pole of a magnet thus attracted only by the two strongest potentials of the field of a magnet meaning its two poles, therefore only depicting the N-S axis direction of a magnet and unable to depict the complete flux of the field which has much more than two potentials! They are really just compasses pointing only at the strongest magnetic potential found in an area and unsuitable for any flux observation. And I will not continue this debate in this thread here. This thread I believe must be dedicted solely to the Ferrocell (ferrolens). YES ! That's what I was looking for. Good old VBcode. Thanks mikrovolt. This will make life easier. A ferrofluid in sandwiched in a glass with lights below.. but this time.. It should have a SLOT in the middle of it for a magnet to go through..
Ring of 36 RGB LEDs around the edge of the cell. I'll ask him if he made any videos of the magnet moving thru the cell center. Back then, LEDs weren't very bright so the lines are not as clear like a modern cell displays. Oh, it was a real b*tch getting the center area sealed! Last edited by dyetalon; 05-15-2018 at 01:17 PM. I think we should discuss the difference between ferromagnetism and ferrimagnetism. Maybe this will help understand whats going on in the cell. What I first notice is the ordering of a ferromagnetic material (All Fe except Fe3O4) is linear in one direction only (iron filings), but the ferrimagnetic material is bi-directional (ferrofluid). There is a major difference in how the light reacts in these two different modes. Bi-directionality has the proper vectors to provide cancellation, where uni-directional materials do not. This is what I refer to when I speak of phase cancellation (N minus S) occurring in the cell. If we graph a magnetic field, we obtain a peak at positive maximum (North) and a peak at negative maximum (South). It actually resembles a sine-wave (as seen on an oscilloscope). If we break this down into math, we get +180 degrees and -180 degrees. What happens if you add these two together? Last edited by dyetalon; 05-15-2018 at 02:24 PM. Glad to have you join the conversation. Finally, ferrimagnetism as prototypically displayed by magnetite is in some sense an intermediate case: here the magnetization is globally uncompensated as in ferromagnetism, but the local magnetization points in different directions. From what I've learned, for the purpose of ferrofluid, the ferrimagnetic and ferromagnetic materials behave very similarly when we're not concerned with Curie temperature, saturation magnetization, and permeability. I don't know about the optical properties. Here's an interesting look at ferrofluid (I think). I liked this video from that site. Those little arrows in the diagrams (which I posted from your post) represent magnetic moments of the particles, grains, or domains in the material. The gross magnetic field of a significant quantity of the material is the integral of all those moments. As shown in the diagram, ferrimagnetic material has a "favored" direction of magnetic moments aligned by the external magnetic field therefore, as you put it, the N & S phases, will not totally cancel. So what happens when you "add these two together", you get what looks very much like ferromagnetism. So much so, ferrimagnetism is covered, and iron oxide on the chart, at the wiki article, which is a pretty good explanation. Yes, thank you, I read that a few times plus much more on the subject. Notice that the first sentence says the Bloch wall is at the boundary between magnetic domains. 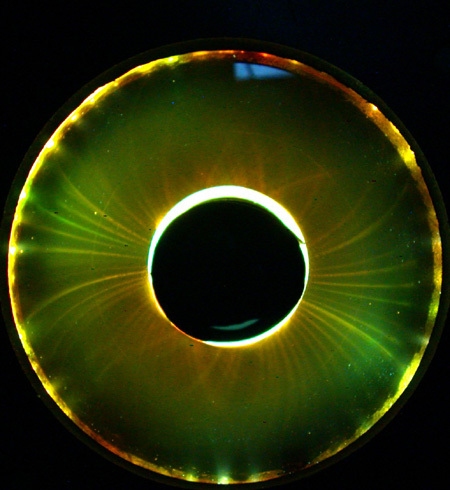 Magnetic domains are a fraction of a mm in size, or even um. So an inch size magnet, or piece of ferro/ferrimagnetic material will contain millions of magnetic domains and similar order of magnitude number of domain boundaries of which many are likely to be Bloch walls. That's right...that one...the one you called "bad science"...Rawls & Davis book. We are closing chapter three with the discussion and drawings presented only to better explain magnetism, the rate of flow direction, the two poles, the division of the two poles, and the potential force as to the electronic charge potential of each pole. This allows a reference to scientists who may not have continued into the physics of electrodynamics. Students and instructors should attempt to upgrade and correct any older text materials that differ from today's concepts and understandings of the basic of magnetism as presented herein. All because they observed a bubble drifting on a microscope slide between magnets in 1936. From what I call tell, this bad science was the beginning of the misuse of "Bloch wall" and spinning static magnetic fields. The origin of fantasy magnetism. As long as I have started and have the Rawls & Davis diagram shown (attch#1), I'll explain some of what's wrong with it. When you do a Google image search for Bloch magnetic domain wall, you see hundreds of hits most looking like attachment #2. Now compare the two diagrams. The primary discrepancy is the labeling of the N & S surfaces. The arrows represent particle or crystal dipoles and point to the N end of the dipole. So the surface of the domain to which the arrows (dipoles) point will be the N side (pole) of the domain which is the top left as shown in attch#2. Similarly, the bottom right will be that domain's N making the upper right surface S as indicated in attch#2. Notice in attch#1 that Rawls & Davis apparently misread such a diagram and labeled the end surfaces N and S. This makes a huge difference. They continue bad science assuming they're looking at a diagram of a magnet of handheld size when the domains, of which there are two shown, are but a small fraction of a millimeter in size. And then their third piece of bad science is to assign spin to the magnetism. I won't even touch their ridiculous broken figure 8. The whole deal stinks. The "Bloch region" actually has a different meaning used in quantum mechanics at the subatomic level. It was in this field where Felix Bloch was awarded the Nobel Prize. I can only wonder if he rolls in his grave. Last edited by bistander; 05-15-2018 at 09:59 PM. My purpose is to establish to the world the real geometry of the magnetic field shown by the ferrocell. Do you understand how significant this is? If we got the geometry of the field wrong this will prevent us from going to the stars!! ...everything changes even the dipole magnetic field of the electron!! to the discovery of dark matter and dark energy domain!! Yes I agree, that is a bad graphic. I'm sure he rolled when that drawing was made. Things have advanced a bit since then. If we continue on with this topic, we will have to look into quantum electrodynamics for more accurate answers. Not my favorite...I'm more of an experimental physics kind a guy. Oh Dyetalon!...Real Wisdom about Magnetism...and Ferrocells...God Bless You my Friend!!! Yes, I believe for the first time I agree with Bistander... ...about the great benefit to have you here with all of Us...it is a GREAT HONOR!! Your paragraph above, which I bold out and specifically the underlined sentences...Oh man...that is the very key to understanding!!! It is very clear...and forgive me, but IMHO, I believe it is not only about the way light reacts with the two different materials (one way directional versus bi-directional)...but basically how they both react completely different to the Magnetic Field. It wasn't about the quality of the graphic but about the science (or lack of science) behind it. Nice graphic from you. I'd like to know more about it. Do you have the source? Back to the subject.... Call it whatever. 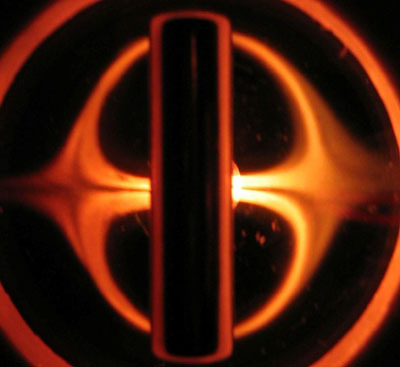 I contend there is nothing special (meaning different) about the center of the magnet. The center has aligned domains just like the rest of the magnet. A couple of mm towards the N looks just like the center or just like a couple mm towards the S.
Last edited by bistander; 05-16-2018 at 03:00 AM. Iron Filings which is a mixture of any kind of Fe...except Fe3O4...is purely LINEAR & DIRECTIONAL, therefore, this is the reason why their alignment to Magnetic Fields "interprets" the One Way Spin Direction, which both poles have...except they do it in a LINEAR-DIRECTIONAL FASHION. Ferrofluids, since they are Bi-directional, have the "ability" to SPLIT DIFFERENTLY for each pole, following each of their centrifugal/emanating directions which are opposed from the center and outwards into Space, following their spatial path all the way to their discharge zone, the center of the magnet. Iron Filings directional alignment positions them between the two higher potential of the Field, the poles...completely ignoring the center discharge zone...since they can not "split-bidirectionally". Globally uncompensated?, yes, of course...We have been guided for over 200 years based on the same "directional interpretation" scheme from ferromagnetism...and all the sudden a new "splitting bi-directional interpretation" from ferrimagnetism...is completely understood we believe this duality of interpretation is "uncompensated"...since it is following "different directions"...don't you think? Anyways, Timm...if by any means you believe I am going off topic above, please let me know and I will delete it, and pass it to other Thread. Last thing I want to do...is to disrupt your excellent thread here. Nothing is the key word here. That's what I've been telling everyone...Zero. Zip. Nada. What's so special about nothing? It follows the lowest potential of the field. Last edited by dyetalon; 05-16-2018 at 02:28 AM. You have to remember that I'm generalizing here. The process is much more complex than just bi-directionality, but it's a good starting point for further discussion. And you are not off topic by any means. I started this thread to talk about the cell and what it shows. Someone may find something I've overlooked, didn't understand or just plain got it wrong. I'll try and explain what I (and a few others) have theorized what the primary functions are. I would like to repost some here as the video link I got where the configuration I was talking about is portrayed. But I would love to see that experiment of yours..
Brian has made some fantastic cells. And he is very creative. I hadn't seen this one before. Maybe after looking thru these things for 13 years I'm accustomed to knowing what to expect from certain lighting and layering. However the ferrosphere is the best! Too bad ya have to shake it like a snow-globe to get it working. Which experiment of mine are you referring to? The one where you shoot the magnet Inside the hole in the center. moving it up and down to see where the high and low magnetic potentials are.. magnets perpendicular and parallel to the ferrolens. Have I seen something like this before? It costs roughly a billion dollars a year to run CERN. Mike Palazzola is another ferrolens genius. He and Brian Kerr have taken this stuff to new levels. Both are highly creative and inventive. Yes. I began using laser with the cell almost exclusively since 2014. Almost all of my research since then has been with laser (and recently, gamma rays). Let me add here: We are seeing another use for the cell. Not only can we view the lowest potential, but we can rotate it or guide the light where we want, magnetically. It can be used either way. To view fields or to control the direction of light. Try that with iron filings ! I'm sure Michael Snyder has video of the event, but its not easy to get his attention these days. He's currently working for NASA on the detection system for Earth-like planets. I think they just launched a satellite last week. I've sent him an email about the video, but who knows when I'll hear back from him? Brians 'slot' video is a good experiment. If/when I hear from Michael, I post a link here. As I understand it, you say we have used a totally incorrect model of magnetic fields to design the billion or so electric motors, generators, actuators and transformers, and the countless magnetic memory devices. Isn't it odd these machines and devices function so very well? I don't want to speak for Markoul, but we haven't used iron filings as a model to build magnetic devices but to try and understand how a magnet works. 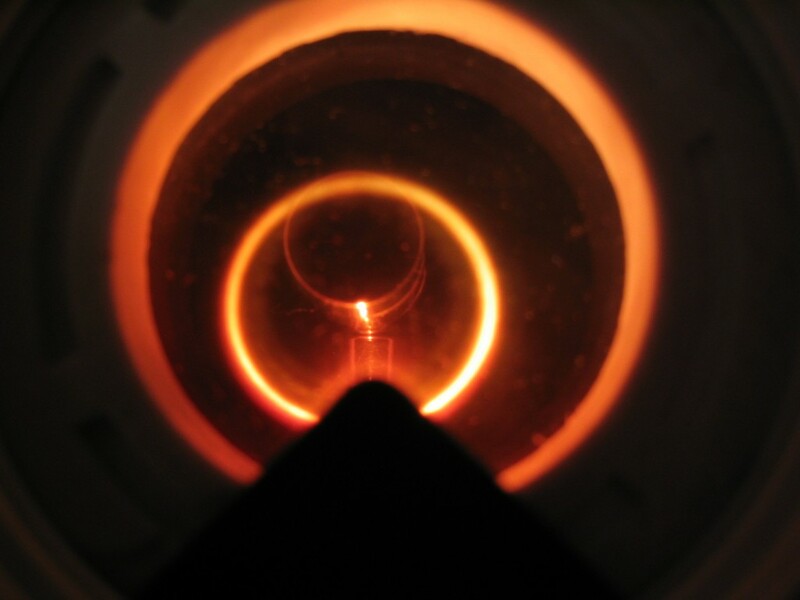 The Ferrocell isn't a replacement for iron filings, but another method of seeing the effects of magnetism on matter. Now we can view from zero (parallel-iron filings) to 90 deg (perpendicular-cell). It's just a different point of view. The filings show us what the greatest potential of the field looks like and the ferrolens shows us the least potential.